After crossing the Crown Range, the road from Queenstown to Wanaka follows the picturesque valley of the Cardrona River where a few remains of the Cardrona diggings can be found. Most of the valley was destroyed in the big flood of 1878, leaving little behind. A few of the miners returned, not to work the valley floor, but the higher slopes. 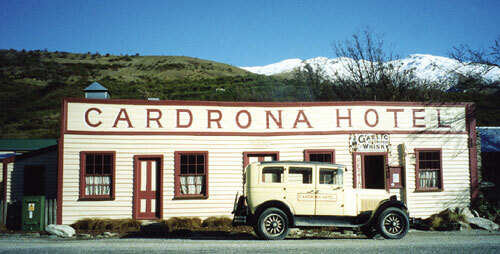 The old Cardrona Hotel, restored in the mid 1980s and again in 2001, has on display a few memories from the past.